Why Do We Calculate Backwards? This book is designed for teachers of children in grades 5 to 10. It shows how Vedic Mathematics can be used in a school course but does not cover all school topics (see contents). The book can be used for teachers who wish to learn the Vedic system or to teach courses on Vedic mathematics for this level. Non-teachers who have a background knowledge of mathematics may also find it appropriate (see contents). Please note that these Manuals do not form a sequence: there is some overlap between the three books. I could purchase three volumes of teacher's manuals only today and these have made me blissfully satisfied with every aspect of it. Teacher's manuals, have brought Vedic methods within reach for teacher's who wish to teach the Vedic system. The message has been blissfully brought home as that Vedic mathematics is a complete system of mathematics, and that it has many surprising properties. The teachers, no doubt, are to be amply benefited through these manuals. But, the students wishing to approach mathematics with this system, can accept these manuals as text books for the topics taken up in these manuals. These manuals also have a guiding light for all those who wish to fulfil their goal of being the textbooks writers of Vedic mathematics. The way, the sequence and steps with which the Sutras deserve to be respected for their inherent features of coherence leading to creativity, may be learnt from the sensitivity of handling of them in these manuals. The bliss with which the virtue of values of pure mathematical concepts have been made a chain of simplified steps to be applied as skills for handling the complex mathematical situations to be within reach as very simple basic arithmetic operations to be worked digit by digit, is so flowing with intensified fragrance throughout that the Author deserves all praise and best wishes for undertaking the unfinished task of covering all remaining topics which could not be covered in these three beautiful Volumes of teacher's manual. Once again, I congratulate you from core of my heart for this wonderful service for the cause of Vedic mathematics. This Manual is the second of three (elementary, intermediate and advanced) Manuals which are designed for adults with a basic understanding of mathematics to learn or teach the Vedic system. So teachers could use it to learn Vedic Mathematics, though it is not suitable as a text for children (for that the Cosmic Calculator Course is recommended). Or it could be used to teach a course on Vedic Mathematics. The sixteen lessons of this course are based on a series of one week summer courses given at Oxford University by the author to Swedish mathematics teachers between 1990 and 1995. Those courses were quite intensive consisting of eighteen, one and a half hour, lessons. The lessons in this book however probably contain more material than could be given in a one and a half hour lesson. The teacher/reader may wish to omit some sections, go through the material in a different sequence to that shown here or break up some sections (e.g. recurring decimals). All techniques are fully explained and proofs are given where appropriate, the relevant Sutras are indicated throughout (these are listed at the end of this Manual) and, for convenience, answers are given after each exercise. Cross-references are given showing what alternative topics may be continued with at certain points. It should also be noted that the Vedic system encourages mental work so we always encourage students to work mentally as long as it is comfortable. In the Cosmic Calculator Course pupils are given a short mental test at the start of most or all lessons, which makes a good start to the lesson, revises previous work and introduces some of the ideas needed in the current lesson. In the Vedic system pupils are encouraged to be creative and use whatever method they like. Some topics will be found to be missing in this text: for example, there is no section on area, only a brief mention. This is because the actual methods are the same as currently taught so that the only difference would be to give the relevant Sutra(s). Vedic Mathematics is an ancient system of mathematics which was rediscovered early last century by Sri Bharati Krsna Tirthaji (henceforth referred to as Bharati Krsna). The Sanskrit word “veda” means “knowledge”. The Vedas are ancient writings whose date is disputed but which date from at least several centuries BC. According to Indian tradition the content of the Vedas was known long before writing was invented and was freely available to everyone. It was passed on by word of mouth. The writings called the Vedas consist of a huge number of documents (there are said to be millions of such documents in India, many of which have not yet been translated) and these have recently been shown to be highly structured, both within themselves and in relation to each other (see Reference 2). Subjects covered in the Vedas include Grammar, Astronomy, Architecture, Psychology, Philosophy, Archery etc., etc. A hundred years ago Sanskrit scholars were translating the Vedic documents and were surprised at the depth and breadth of knowledge contained in them. But some documents headed “Ganita Sutras”, which means mathematics, could not be interpreted by them in terms of mathematics. One verse, for example, said “in the reign of King Kamse famine, pestilence and unsanitary conditions prevailed”. This is not mathematics they said, but nonsense. Bharati Krsna was born in 1884 and died in 1960. He was a brilliant student, obtaining the highest honours in all the subjects he studied, including Sanskrit, Philosophy, English, Mathematics, History and Science. When he heard what the European scholars were saying about the parts of the Vedas which were supposed to contain mathematics he resolved to study the documents and find their meaning. Between 1911 and 1918 he was able to reconstruct the ancient system of mathematics which we now call Vedic Mathematics. He wrote sixteen books expounding this system, but unfortunately these have been lost and when the loss was confirmed in 1958 Bharati Krsna wrote a single introductory book entitled “Vedic Mathematics”. This is currently available and is a best-seller (see Reference 1). 1) The system rediscovered by Bharati Krsna is based on sixteen formulae (or Sutras) and some sub-formulae (sub-Sutras). These Sutras are given in word form: for example Vertically and Crosswise and By One More than the One Before. In this text they are indicated by italics. These Sutras can be related to natural mental functions such as completing a whole, noticing analogies, generalisation and so on. 2) Not only does the system give many striking general and special methods, previously unknown to modern mathematics, but it is far more coherent and integrated as a system. 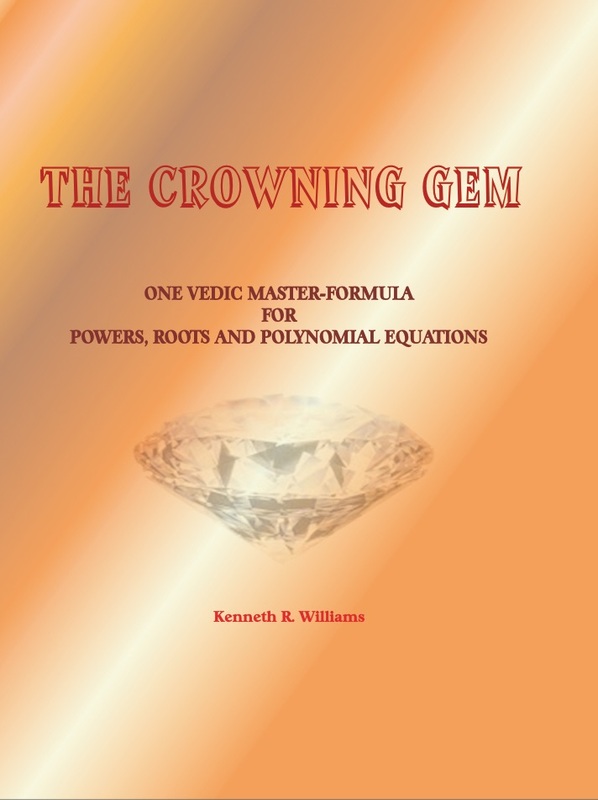 3) Vedic Mathematics is a system of mental mathematics (though it can also be written down). Many of the Vedic methods are new, simple and striking. They are also beautifully interrelated so that division, for example, can be seen as an easy reversal of the simple multiplication method (similarly with squaring and square roots). This is in complete contrast to the modern system. Because the Vedic methods are so different to the conventional methods, and also to gain familiarity with the Vedic system, it is best to practice the techniques as you go along. Dividing by 11, 12 etc. ¯ Vedic Mathematics was reconstructed from ancient Vedic texts early last century by Sri Bharati Krsna Tirthaji (1884-1960). It is a complete system of mathematics which has many surprising properties and applies at all levels and areas of mathematics, pure and applied. ¯ It has a remarkable coherence and simplicity that make it easy to do and easy to understand. Through its amazingly easy methods complex problems can often be solved in one line. ¯ The system is based on sixteen word-formulae (Sutras) that relate to the way in which we use our mind. ¯ The benefits of using Vedic Mathematics include more enjoyment of maths, increased flexibility, creativity and confidence, improved memory, greater mental agility and so on. ¯ This Intermediate Manual is the second of three designed for teachers who wish to teach the Vedic system, either to a class or to other adults/teachers. It is also suitable for anyone who would like to teach themselves the Vedic methods. 11. Why Do We Calculate Backwards?